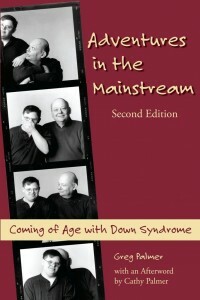 Greg Palmer, an award-winning writer and producer of PBS documentaries and plays for families, chronicles two of the most important years in the life of his son, Ned, who has Down syndrome-the time when he’s making the transition from high school to work. This intimate, often humorous, account is woven with vivid anecdotes concerning school, family, relationships, and work (both Ned’s and Greg’s), including a father-son cruise around the British Isles;, Ned’s band conducting debut;, and an amusing visit to a Hooters restaurant. Greg makes us care about his son’s strengths and foibles as he does, whether describing how Ned impresses strangers by reciting poetry and playing the piano or his struggles to learn to handle money, responsibility, and the death of a friend. An absorbing and insightful read, ADVENTURES IN THE MAINSTREAM offers reassurance to other parents and enlightens us all about what’s really involved-for father and son-in a young man’s important journey from adolescence toward adulthood.